Karwar is known as the ‘Kashmir of Karnataka’, and with good reason! Karwar lies at the confluence of the River Kali and the Arabian Sea, deriving its name from the nearby village of Kadwad (or Kade Wada, meaning the ‘last area’ in Kannada and Konkani). This beautiful beach city lies on India’s western coast, around 120km south of Panjim, Goa. The Baithkol Cove, which is the natural port for Karwar’s harbor, derives its name from an Arabic word ‘Bait-e-kol’, which means the Bay of Safety. Karwar was historically known as Sindpur, Chittakula, Chitrakul or Cintacora by Portuguese traders during the 1500s and 1600s. During the late-1640s, Karwar became an East India Company trading town for commodities such as cotton, cardamom, black pepper, and muslin. After the Marathas were conquered in the 1700s, Karwar fell to the British and later became an Indian Naval Training Site during World War II. Today, it is the administrative center of the Uttara Kannada district and a center for tourism, manufacturing, and agriculture. Karwar prides itself on being a historically and culturally important town. The festival of Shivaji Jayanti is celebrated with pomp and splendor since Karwar was ruled by the Maratha Emperor Shivaji during the 17th century. In fact, it is also said that the tranquillity of the town inspired Bengali Nobel laureate and poet Rabindranath Tagore who visited the place in 1882 and penned his first play there. The annual Karwari Festival which is held on Tagore Beach is visited by many tourists every year. Since Karwar is a beach destination, summers are hot and humid with temperatures touching 30-38 degrees Celsius. Monsoons are moderate while winter temperatures hover around 17-29 degrees Celsius. 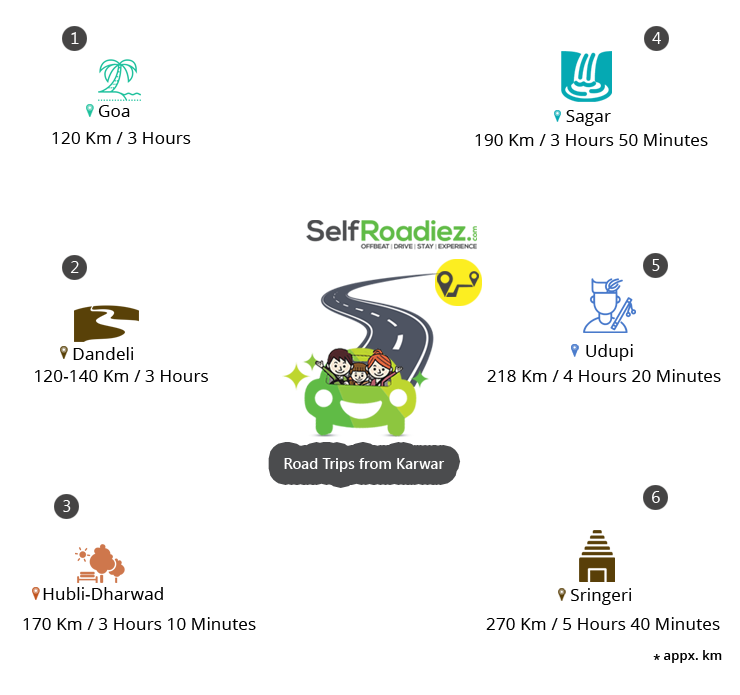 Monsoons and the winters are the best time to indulge in road trips around Karwar. The nearest airport to Karwar is Goa International Airport which lies around 100 km away via NH 66. The nearest major railway station is the Karwar Railway Station which lies around 6km from the town center. The station is part of the famed Konkan Railway route and connects Karwar to most major towns and cities across the western coast. From traditional Karwar, get set going to the heady sun-kissed beaches of Goa. Visit the centuries-old churches of Basilica of Bom Jesus and St. Paul’s Cathedral, or amble through the village set up of Ancestral Goa. 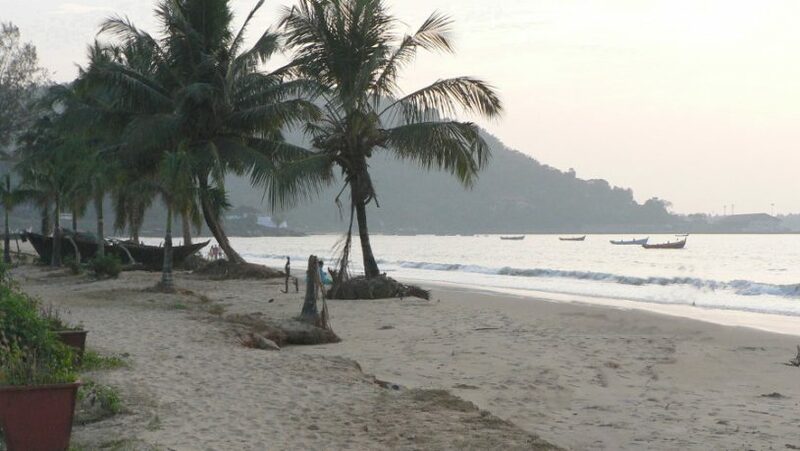 Travelers can soak in the sun on the beaches of Colva, Baga, Vagator and Palolem, and party on the beaches of Anjuna. They can saunter through the flea markets at most of the beaches and visit Fort Aguada and its beautiful beach where one can indulge in parasailing. The 90-year-old adventurous hub of Dandeli lies on the banks of River Kali in Karnataka and attracts adventure and nature lovers from all over the country. Travelers can do kayaking, river rafting, cycling, trekking, visit the wildlife sanctuary and the limestone caves or watch views from atop Ganeshgudi and Shiroli hills. Although Hubli-Dharwad is largely an industrial region, there is no dearth of places that travelers can explore. They can visit the Chandramouleshwara and Banashankari temples, the Utsav rock garden, and Indira Gandhi Glass House garden, Gangubai Hanagal memorial musical museum, Unkal lake, Nrupatunga Hill, the Maier Memorial Church and the Centre for Introspection and Enlightenment. Located in the Shimoga district of Karnataka, Sagar (or Sagara) in the Western Ghats is surrounded by places of natural beauty. Places to see in and around Sagar include the popular Jog Falls, Dabbe Falls, the Sharavati Wildlife Sanctuary, the tourist towns of Honnemaradu and Holebaagilu and the Linganamakki dam. There are also many places of worship such as the Marikamba temple, the Keladi Shiva temple, and the Sigandooru Chaudeshwari temple, among others. Buzzing with activity and yet relaxed, the pilgrim and temple town of Udupi is famous for the 13th-century temple dedicated to Lord Krishna, which is welcome to non-Hindus as well. Hence, it also goes by the name of Krishna Nagari (Krishna’s Land). The town is also famous for its vegetarian cuisine, recognized as ‘Udupi cuisine’ wherein originate the delectable dishes of thali and dosa. Places of interest include Malpe beach, Bahubali statue, Karkala Jain temples, and the Moodabidri Jain temples, among others. The historic hilly town of Sringeri lies on the banks of the River Tunga, deriving its name from the nearby hill of Rishyashringa-giri. According to a legend, Adi Shankaracharya is said to have chosen Sringeri as the site to live and teach his disciples for 12 long years. Sringeri is home to numerous historic temples such as Sharadamba temple and the Vidyashankara temple, which is famous for the 12 zodiacal pillars of Adi Shankaracharya. Other places of interest include the Sringeri Matha, and the Kigga, Hanumanagundi and the Sirimane waterfalls. Karwar offers a whole lot of activities for nature lovers and adventure seekers. Travelers can go dolphin spotting, kayaking, indulge in banana boat rides on the high seas, bird watching, trekking, motor boating, snorkeling and river rafting. For those who wish to kick back, explore the serene beaches of Karwar such as Tilamati beach which is famous for its black sand, taste the delectable Konkani seafood cuisine that Karwar has to offer, see INS Warship Museum, and watch the sunset from Baithkol port. One can also check out the virtually unexplored tortoise-shaped Kurumgad island which can be reached by boarding a ferry from Devbagh beach, where one might be able to spot jellyfish and tortoises or trek to the island’s hills and get stunning views of the Arabian Sea. Since Karwar is a beach destination. most of the accommodation are beach resorts or cottages, with different budgets of travelers such as honeymooners and adventure enthusiasts. The resort derives its name from the nearby Devbagh village where you can get a glimpse of the daily life of fisherfolk. The resort is situated amidst a Casuarina grove with seven log huts, four regular cottages, and six tented cottages providing comfortable accommodation options. Since Karwar is an important Naval base for the Indian Navy, many beaches and stretches of the coast are out of bounds for the general public. Some of these places include Arga Beach and Casurina Beach. Travelers need to check on the access to these beaches before they head out to them. Karwar is the perfect place if one wants to have a combination of a laid-back and yet adventurous holiday.